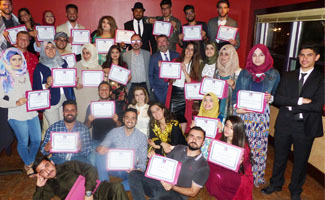 Nearly three weeks long, the Iraqi Young Leaders Program (IYLEP) this summer has meant a busy schedule of classes and cultural exchange opportunities for the 25 participants. The goal of the annual program is to provide inspiration to the program participants to affect social change in their home country. The IYLEP visits are sponsored the U.S. State Department. Public policy education for group has included courses at UMass Amherst on the many ways public policy affects society such as constitutional rights, journalism, environmental policy, election campaign simulations, and U.S. foreign policy. Off-campus, they made numerous visits to popular locations in western Massachusetts including Northampton, Montague Bookmill, and the Leverett Peace Pagoda. Additionally, 2-3 person groups had home-cooked meals with local residents. Trips to New York and Washington DC rounded out their five-week stay in the United States. Read more about the program in their own words here. Additionally, they were involved in a very special community project. As the IYLEP program has done for the last several years, the participants assisted the Amherst Senior Center in delivering meals to area seniors at their homes (Meals On Wheels). Also, the IYLEP group’s final event in Amherst was an Iraqi cultural fundraiser at Bistro 63. The event raised $650 for senior center programs. The Daily Hampshire Gazette covered this unique relationship. The UMass Civic Initiative has also hosted other summer programs with participants from Argentina, Pakistan and many other countries. A fall program of 20 young leaders from southeast Asia will start in September. A 2016 MassLive.com article on the southeast Asian program can be found here.